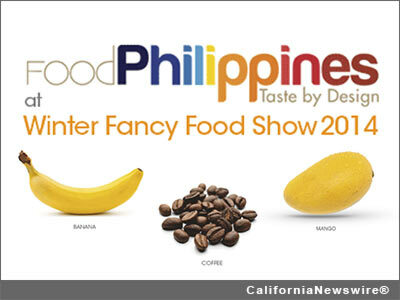 SAN FRANCISCO, Calif. /California Newswire/ — The Philippine Department of Trade and Industry, through the Center for International Trade Expositions and Missions, and the Philippine Trade and Investment Centers in Silicon Valley and Los Angeles, is gearing up for the Philippine participation at the 2014 Winter Fancy Food Show on January 19-21, 2014. The Philippines' country pavilion will be located at the South Hall of the Moscone Center, San Francisco. From its successful showcase in Anuga last October 2013 in Germany, Food Philippines makes its way to North America with the finest organic and specialty food and beverage products of the country showcasing the country's top-of-the-line products like banana chips, fruit preserves, herbal teas, juices and concentrates, mixes and sauces, muscovado products, organic coconut products, single-origin chocolates, snack items and spices. The 16-booth Philippine Pavilion will house Philippine food manufacturers and exporters of specialty food identified under the Department's Design for Exports (DEFood) Program. Participating companies are Celebes Coconut Corporation, GSL Premium Food Export Corporation, Herbanext Laboratories, Islamic Da'wah Council of the Philippines, JNRM Corporation, Malagos Agri-Venture Corporation, Mama Sita's, Pacific Isles International Trading, Inc., Prime Fruits International, Inc., Raw Brown Sugar Milling Company, Inc. and other companies featuring Natural, Organic & Heritage Products. The Philippine International Trading Corporation, the country's state trading firm, will also showcase, an excellent selection of other Philippine specialty food products at the Philippine Pavilion. DTI Underscretary Ponciano C. Manalo, Jr. said, "That the seven products that the country is known very much for are coconuts, pineapples, mangoes, bananas, coffee, cacao and tuna. These have distinct characteristics influenced by our geographical location such as climate, soil and humidity, which sets them apart from similar products by other countries." Through the Winter Fancy Food Show, the Philippines bids to tap into North America's massive food and beverage market. The region's ethnic food market is estimated to grow at five percent annually. The Halal and Kosher food markets are also strong in the region. North America's Halal food market is worth US$12 billion, while the Kosher food market is estimated at US$200 billion. Organized by the Department Trade and Industry (DTI) through its representative offices and commercial sections in the Consulates General in San Francisco and Los Angeles, CITEM and the Philippine International Trading Corporation, the country's participation in the 2014 Winter Fancy Food Show is one of DTI's major efforts to intensify the promotion of Philippine specialty food products in overseas trade shows. Institutional buyers, food enthusiasts and attendees of the annual Winter Fancy Food Show will be able to visit the Philippine Pavilion at booths 3028-3043 at the South Hall, Moscone Center. The Pavilion will feature live cooking demonstrations by multi-awarded San Francisco-based Filipino American Executive Chef, Thomas Weibull. Chef Weibull, who trained at the Kristineberg Restaurant and Hotel School in Stockholm, Sweden, is the executive chef at the renowned Clift Hotel in San Francisco, and was the former Executive Chef of famed Plouf Seafood Restaurant in the same city. He won the professional division of the 2012 Annual Kulinarya Competition organized by the Philippine Department of Tourism, the Philippine Consulate General in San Francisco and the Philippine Trade & Investment Center in Silicon Valley. The Philippine Trade & Investment Center Silicon Valley, commercial section of the Philippine Consulate General in San Francisco, will hold a Press Conference and Business Networking at the Philippine Center on January 21, 2014 at the Philippine Center Ground Floor Gallery. The delegation will then proceed to Los Angeles, Calif. on January 22, 2014 for more business matching activities. For additional event information, please visit http://investphilippines.org/siliconvalley/events/ . For more information and other related inquiries, e-mail the Philippine Trade and Investment Center-Silicon Valley at siliconvalley@philippinetrade.org or info@investphilippines.org or call +1 (415) 773-2336.